Tucked into upland forest along the Upland Walk, First Light Village is a nature playspace, a special place for children to enjoy creative outdoor play. In contrast to traditional playgrounds, nature playspaces are made almost entirely of natural materials. Designed and constructed by a local Eagle Scout with a keen interest in Native American lore, the playspace features two wigwams, a turtle-shaped tree stump ring, a snake balance beam, and more. As a museum in the Let’s Move! network, an initiative launched by First Lady Michelle Obama, the Arboretum is committed to promoting healthy physical activity for children and families. 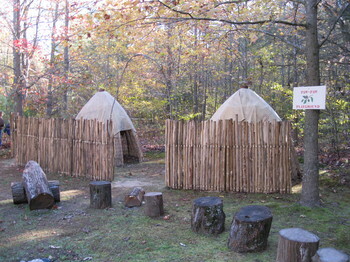 First Light Village is open daily from 10 a.m. to 4 p.m. Use of the playspace is free with Arboretum admission.